We all eat it. If you say you don't eat cake, you're probably a closet cake eater. It's the staple of birthdays!! I get my special cake in December. Have to eat everyone else's cake throughout the year. Not that I mind that much. 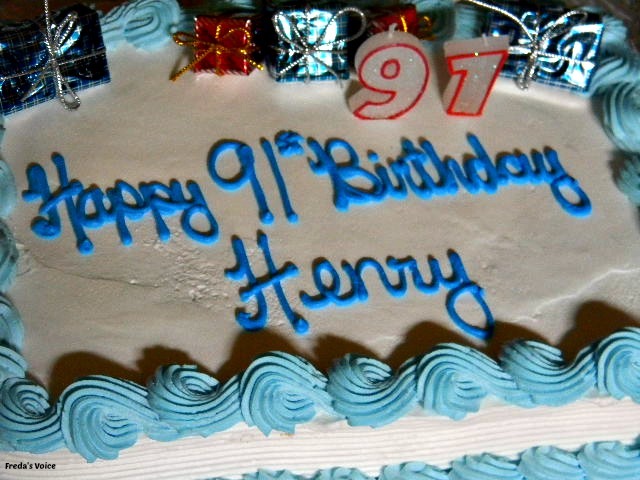 How many of us will celebrate our 91st birthday?? Not too many I would imagine. My sisters' father-in-law just turned 91 on Saturday and this is his cake. Henry is a sharp, intelligent, bookloving veteran of the Korean War. He is originally from Prince Edward Island, with Irish roots, but has lived in Ontario for a long time. Whenever I visit my sister, who lives with her in-laws, Henry is always sporting a big smile and has a book in hand. It was truly an honor to celebrate his birthday with him. As you can see, he is not loving our rendition of the birthday song, but again is filled with smiles!! This is a classic Henry moment! One I will always treasure too. As I look back on this day, past birthdays and more birthdays to come, I can't help but wonder why cake? Why has it always been the go-to item for birthdays? Why not steak. Yeah, big ole birthday steak!! Imagine frosting a steak. That's why! 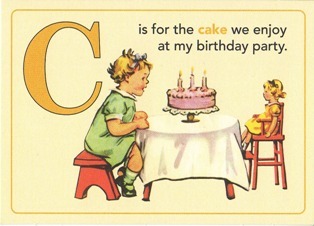 Okay enough of my cake and birthday rambles... time to "C" what you have going on. DISCLOSURE: Freda's Voice received no compensation. Opinions are 100% owned by this blog. I admit that I much prefer frosting on cake over frosting on steak! Love the hands over his ears. Too funny. how wonderful to be that strong at 91! i met a 93 year old man last weekend who had some physical issues, but boy was he on it mentally. inspiring! Wow, Happy Birthday to Henry. What a wonderful reason to celebrate! Happy birthday, Henry! The frosting is the best part!! Looks like Henry was enjoying his birthday, even the birthday song!! Imagine, 91 years young. Such a fun, happy post. Henry looks quite enthralled with whole thing. Happy Birthday Henry! Great letter C post! I love your clever post for the letter "C"! The picture of him covering his ears gave me a little chuckle! Cool post for the letter "C".